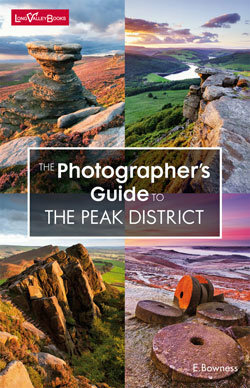 The Photographer's Guide to the Peak District is the latest in this informative and useful series by Ellen Bowness. Much like The Photographer's Guide to the Lake District, this book contains everything you could possibly need to know about photographing a certain area of the country. Split into chapters on the North, South, East and West of the Peak District, you can easily find an area you'd like to visit and photograph. These books now feature satnav information for all of the destinations, making it easier to find your way there using a smartphone or car navigation system. The maps also have more detail than the Lake District book, meaning there is less need to carry an OS with you if you don't want to. At the start of each section, maps of the areas looked at are used to pinpoint the destinations that will be discussed in detail throughout the chapter. Each location has at least a page dedicated to it, detailing what makes the location so photogenic, what time of the year and day it's ideal to photograph there, and how to get there, along with grid references. At the back of the book there is information on parking and transport, sunrise and sunset times, how to read OS grid references and a location summary table, with information such as type of location, difficulty of walk, time from car park to reach the destination and photographic interest from 1 to 5 stars. The book is filled with beautiful images form local photographers who know the location down to a tee. This book is ideal if you already have technical photographic knowledge, and are looking for location ideas to expand your portfolio of landscape photos. It's also great for those new to an area, or even those who might live near these destinations but may not know they exist. A thoroughly enjoyable and useful book.